Slatwall peg hooks in a variety of sizes! White Slatwall Peg Hooks display products neatly. Hang bags, packages or hanging items. 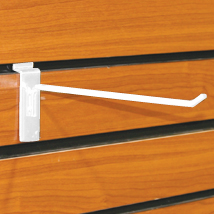 Slatwall Hooks are available in several different sizes to fit your slatwall panels or displays. .228 thick wire.